Lisa Peck at YCO asks me to broadcast the news that there'll be a Broker’s Open Day aboard the new 38m motor yacht Shooting Star on July 6th at the Monaco Yacht Club between 2pm and 5pm. 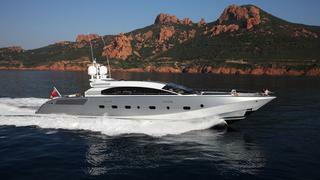 A high-performance yacht, Shooting Star was launched by Danish Yachts as recently as March 2011. Designed by Espen Øino, Shooting Star was built in lightweight composites and is capable of speeds in excess of a blistering 45 knots powered by twin 4613hp MTU engines driving waterjets. A light, airy interior by Art-Line provides accommodation for up to 10 guests and her asking price is €18.5 million.